Markus Chambers will become councillor in Winnipeg's new St. Norbert-Seine River ward. Markus Chambers will be the first person to sit on city council for Winnipeg's new St. Norbert-Seine River ward. Chambers said he made the decision in February to put his name on the ballot for Wednesday's civic election after working as a civil servant for nearly three decades. "It was actually right at the end of Black History Month, I was kind of tapped on the shoulder and somebody said to me you've got to put your name forward for city council," said Chambers. He believes he is the first black person elected to city council. "I'm honoured for that … but I am going to work hard for everybody in the ward and the entire city." Chambers defeated four other candidates, including Nancy Cooke, an assistant to the infrastructure minister, and transportation engineer Glenn Churchill. 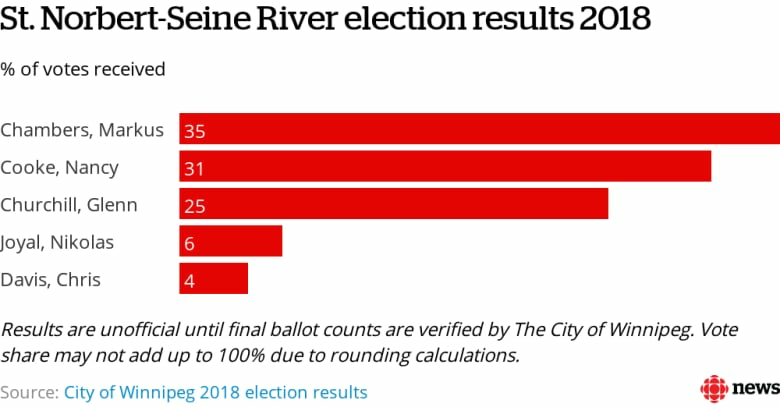 Nikolas Joyal, a 22-year-old political studies student at the University of Manitoba, and courier Chris Davis also ran in St. Norbert-Seine River, where there was no incumbent councillor following ward boundary changes this year. Under the changes, the old South Winnipeg-St. Norbert ward (previously the city's largest, with a population of 68,112) was cut in half. That created the new ward of Waverley West (where previous South Winnipeg-St. Norbert Coun. Janice Lukes was acclaimed) and the ward now called St. Norbert-Seine River. The ward is made up of 15 neighbourhoods in the southeastern end of the city, including St. Norbert, Fort Richmond, River Park South and St. Vital Perimeter South. The ward now has 47,765 residents, according to 2016 census data. 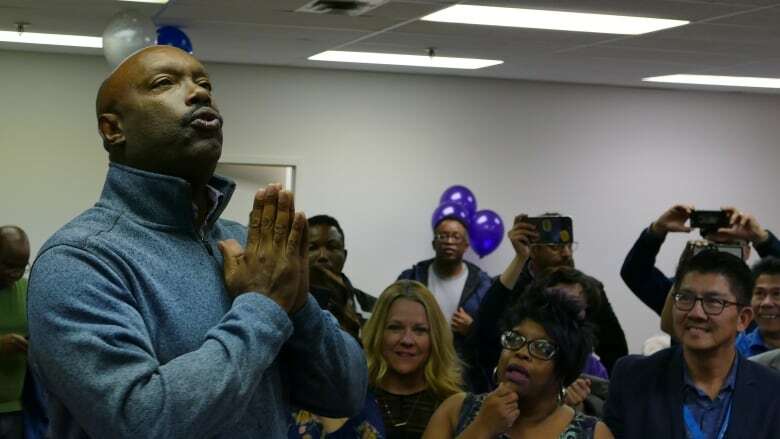 Although Chambers has been living in River Park South for 25 years, and says he knows his community, he wasn't sure how he would be received at the door when he started campaigning in June. "Everybody was engaging, everybody was passionate about the ward," he said Wednesday night. "There's a lot of great things with our community, some things that need fixing and that's what were going to work for in the next four years to improve on." Chambers has spent his career working in public service, currently working as the manager of Manitoba Education and Training's employer engagement unit. Over the past 29 years he's worked with students, newcomers and low-income families. He said those experiences working in public service have helped him understand policy and intergovernmental relations. He campaigned on improving access to public transportation and affordable housing for students at the University of Manitoba, and building on Janice Lukes's work to crack down on illegal rooming houses around campus. He also committed to keeping parks and paths clean, as well as adding to the existing network of trails to improve active transportation. Chambers and his wife Judith have two sons, who are in their 20s. With files from Bartley Kives, Laura Glowacki and Caitlyn Gowriluk.